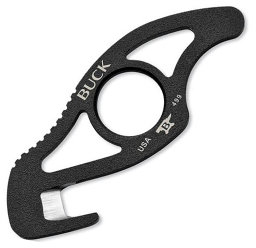 Buck Knives is all about improving hunting performance. For Buck Knives, hunting is where it all started and this is still the main focus for them. Buck Knives is constantly making refinements that improve the performance of their hunting knives and crafting new designs that help allow hunters to improve performance of field dressing and skinning. This Guthook Ring hunting knife is lightweight, compact and convenient. The Guthook Ring is a great and inexpensive accessory to any hunter, offering very good durability and reliability for field dressing any game. The design of the Guthook Ring Hunting Tool has been modified to improve performance by increasing the width of the cutting edge to enable one to cut through a thicker hide. The Guthook Ring tool is intended to be a companion to your favorite skinning knife.